how do you share your core beliefs effectively? This week, we'll delve into the personal essay: a short, pointed essay that speaks to your beliefs and the experiences/people/places that have shaped them. 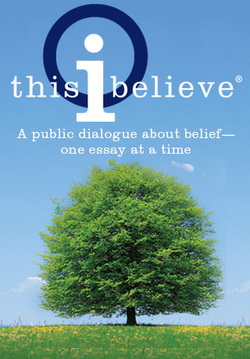 This module uses material from the official This I Believe curriculum, and as such, I can't share specific activities or prompts on the website. If you miss a day, check in with me, please. What is the difference between personal writing and transactive writing? What does clear, concise writing look like? Students will understand that personal writing involves connecting experiences with ideas to reflect on a deep meaning to the writer - it reflects rather than persuades. Students will understand that clear, concise writing requires utilizing the entire writing process (prewriting, drafting, sharing, revising) to ensure the piece has a focal point and that every word helps reach that point. What is the core belief expressed?